Sometime in 2009, a Harry Potter theme park will open in Orlando, Fla. I know what you're thinking — just what Orlando needs: another theme park. It's part of the business philosophy that if you are lucky enough to make money as fast as bills can be printed, keep milking it and try to make more. The new park will be called, "The Wizarding World of Harry Potter." I guess they started to go with some alliteration, but ran out of words that begin with "W." It will have rides, exhibits, and — surprise, surprise — shops. If the Harry Potter Park pans out, I'm sure other books and movies will follow. Some titles just might lend themselves to the transformation — like "Shrek." However, I hope those who build these things will restrain themselves and not go for an amusement park version of the current film, "Knocked Up." Philadelphia would be the natural site for the "Rocky" theme park. There will be the "Yo, Adrienne Room," where you'll be taught to speak almost unintelligibly. Grown-ups and children will be coached in saying lines like, "Yo, Adrienne, it's me, Rocky ... I don't know what to say, 'cause I ain't never talked to no door before, ya know?" Next, you go into The Ring where you get to fight a virtual boxer and get the virtual stuffing beat out of you. No visit to the park would be complete without a stop at the gift shop where you can buy things like the cologne, "Eau de Boxer's Sweat." The "Ocean's 11" franchise is only a sequel or two away from being ready for theme park stature. For this one, the customer enters, and is immediately given fantastic clothes. After walking through the "Wink At The Camera Room," you'll experience roller coasters, jumping out of burning buildings, and being run over by trucks carrying dangerous plutonium. Then someone helps you up and you realize that those fabulous clothes they gave you don't have one single wrinkle. I think the time is right to turn Al Gore's bestseller about global warming, "An Inconvenient Truth," into a theme park. It is very, you should excuse the expression, "hot" right now. Apparently, even the president has read and been moved by it. How else would you explain his recent and sudden reversal on global warming? Anyway, "Al Gore's Wacky World of Warming" would have exhibits, including a scary ride through Hurricane Country, and a scenic view of continents flooding. You can also see a 90-year-old woman, sitting in her mock living room, who removes her overcoat saying, "Oy, it's even hot in here for me." If you just want to relax in a place where there's nothing going on, there's the FEMA Room. George Tenet's book, "At the Center of the Storm: My Years at The CIA" might make a nice place to take the kiddies. This theme park would include rides that just go around and around in confusing circles, while various people are heard to say, "It's not my fault." And all those popular diet books could combine to make a perfect theme park, probably called something like, "Lose Pounds and Inches Simply By Giving Us Your Money For Our Books." The customers walk in and are starved and forced to do vigorous exercise. Almost immediately, they lose a few pounds, so they have to buy better-fitting clothing from the gift shop. Next, they go through a confusing labyrinth populated by diet "experts." By then, the customers will have gained back all the weight they lost plus more. That's when they have to buy new clothes again from the theme park gift shop. If theme parks based on books and movies are big successes, maybe soon there will be theme parks based on columns. However, I would never succumb to the temptation of having my column turned into some crass commercial moneymaking machine. 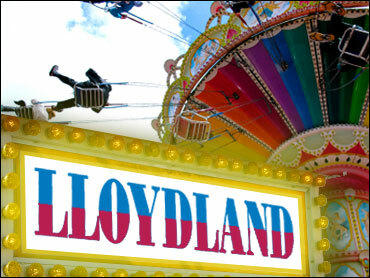 In fact, if those who build theme parks want to know more details about why I'm not interested, they can contact me and my accountant at LloydGarver@yahoo.com. Lloyd Garver has written for many television shows, ranging from "Sesame Street" to "Family Ties" to "Frasier." He has also read many books, some of which won't get theme parks.